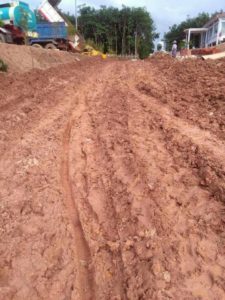 HURFOM: Locals report that trucks from the Bedok Construction and Engineering Co., Ltd (BCE) have destroyed the road between the villages Tha Byay Thit and Da Min Sake, in Hnint Kayin village tract, Ye Township. As a result of the company’s trucks using it to transport sand and stone, local villagers and students have found the road almost impassable. Tha Byay Thit village is a mile from Da Min Sake, and two miles from Hnint Kayin. Da Min Sake village has about 20 houses. Between 10 to 15 students travel every day to the primary school in Tha Byay Thit to study, according to Min Lawi Nyan, a member of Ah Nin Environmental Conservation Group. “In Da Min Sake, the students’ parents work as fishermen, so they have no time to accompany their children to school. The students have to go to school alone by bicycle. Since the road has been destroyed, it is impossible to walk along the road, even for the adults. It’s impossible for them to go by bicycle. Moreover, there are factories on each side of the road, and villagers feel the heat [emitted from the factories] when they pass near them,” said Min Lawi Nyan. As the road is the only way to travel between the two villages, the villagers and the students have experienced a huge transportation hardship. Moreover, Da Min Sake does not have a local clinic. Patients who may need emergency care are at risk, as their only road to the clinic now cannot be used. “The road has been destroyed; we can’t use it. When we try to go through the rubber plantations, the plantation owners block the way with bamboo poles. So we have to use the destroyed road. We have to push our motorbikes, and we frequently fall. We’re experiencing a lot of trouble,” said U Thein Tun, a villager from Tha Byay Thit. Students have to leave 30 minutes early to go to school, and when they get to school they have to change their uniforms because they’re covered with mud from walking along the road. The villagers have reported to the company that the road has been destroyed by their trucks. 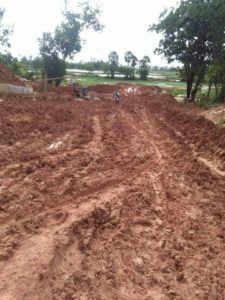 The company promised to repair the road, but the villagers are still waiting for this to happen, according to U Thein Tun. “The company hasn’t repaired the road properly yet. When they did some repairs, they just repaired it for their trucks. They didn’t repair the road for the villagers. The villagers say if they repair the road themselves the trucks will just destroy it again, so there’s no point in them making repairs,” continued U Thein Tun. Min Lawi Nyan verbally reported the issue to Dr Aung Nyne Oo, the Deputy Speaker of the Mon State Parliament. He replied that he would carry out a field investigation. He also said that he would inform the local authority and the relevant government departments of the villagers’ needs, and that he would urge them to undertake urgent repairs of the road to ease locals’ transportation hardships. In May 2018 local farmers from northern Ye Township petitioned the Mon State Parliament to remove BCE utility poles from farmers’ land. BCE had installed the utility poles as part of their 24-hour electricity project in Northern Ye Township. Local farmers have not received compensation for this use of their land. “Investment projects promise local development, but in reality, local villagers experience hardship as a result of the projects”, according to Min Lawi Nyan. The Mon State government and BCE signed a multi-development project agreement for Ah Nin village on March 9th 2017 in Mawlamyine. BCE has already been granted permission from the Union government to distribute electricity in Mon and Karen states and parts of Tenasserim Division. On March 9th 2018, the Bedok Construction and Engineering Co., Ltd. signed an MOU with the Mon State government at the Aung San Hall of the Mon State government office to develop a Special Economic Zone between Ye and Thanbyuzayat Townships.